:) Good for you:)It must be such a relief.I love deviled eggs. I imagine there are some people who dont like deviled eggs, but I'm glad I don't know them. A little candied bacon was just the right extra for these. I LOVE deviled eggs, Rosemary! But I've go to tell you....I could just eat a plate of your candied bacon alone! Can't wait to try your recipe with the addition of bourbon! Happy to see you celebrating today and I hope you are doing well! Hooray for reaching this milestone! I was wondering why I hadn't seen you in the blogosphere much, and now I know why. Prayers for a complete recovery. P.S. 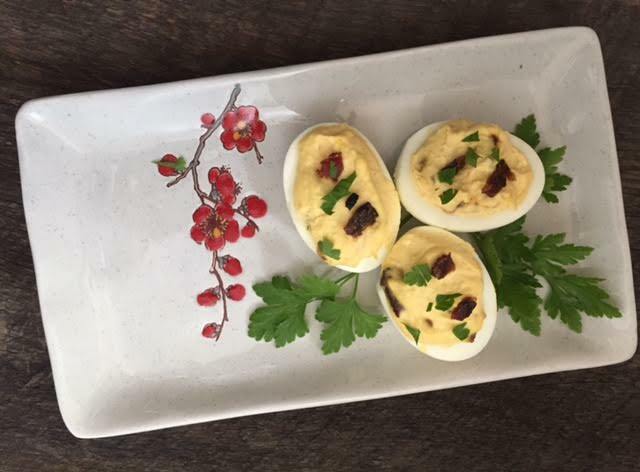 Bill loves deviled eggs and these look fantastic. Thanks, Liz. I surely have missed being around -- wondering if I had anything unique to say, but say it, I will. 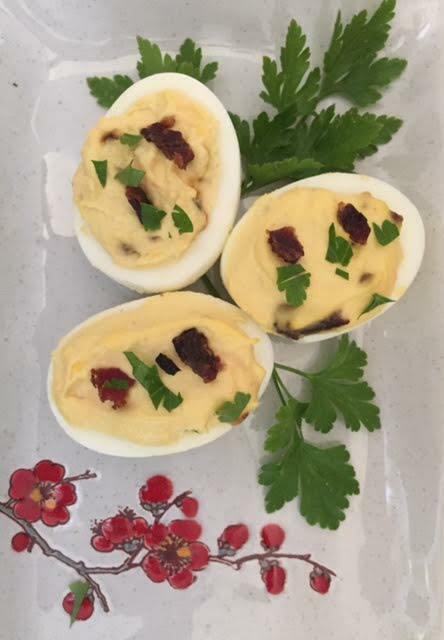 Deviled eggs are always a hit, aren't they? Gussied up, or not! Is bourbon like bacon?!? I think I'll have to consult with you, John, before I decide with what libation I want to do more celebrating! Over the top deviled eggs sounds like the perfect way to celebrate and yours are perfect. Even though you have more treatments ahead, you are one major step in the right direction. What a fun way to play with deviled eggs. I'd much rather have bacon than olives!